Sport-Brella 8-Foot Umbrella Just $39.98! Down From $60! PLUS FREE Shipping! You are here: Home / Great Deals / Amazon Deals / Sport-Brella 8-Foot Umbrella Just $39.98! Down From $60! PLUS FREE Shipping! Head over to Amazon to score this Sport-Brella 8-Foot Umbrella for just $39.98 down from $59.99 PLUS FREE shipping! 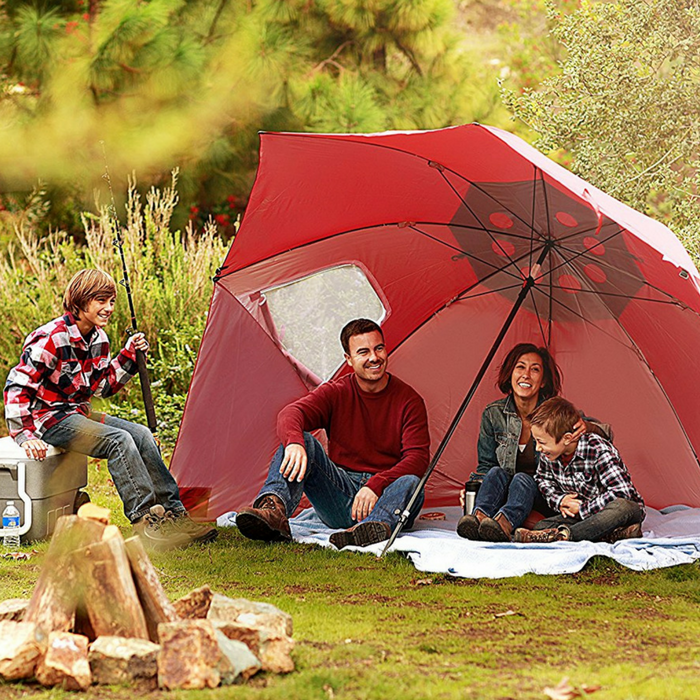 Stay safe and protected from the sun or the rain with the Sport-Brella for all your outdoor adventures. Whether it’s time for the football championships, or you’re spending your day on the shore, be confident that you have shelter with this 9 ft. wide canopy umbrella. With UPF 50+ protection, and 99.5% protection from UVA and UVB light, you’ll have a place to go whenever you need it. Really nice! Hurry before the day ends! UPF 50+ PROTECTION. The Sport-Brella XL will keep your skin safe and protected from over 99.5% of UVA and UVB rays. With side panels for extra coverage and wind flaps for ventilation and airflow, you’ll get everything you need. THE ESSENTIALS. Keep valuables safe in the internal side pockets and gain extra visibility with the dual canopy with top vents and side zippered windows. The telescoping pole has a plastic tip is held in place by lever. WATER REPELLENT AND WEATHER PROTECTION. Protect yourself from rain, wind, or sun with the Sport-Brella XL. The water repellent structure will keep you dry and relaxed on rainy game days, or cool from the warm summer sun at the beach.